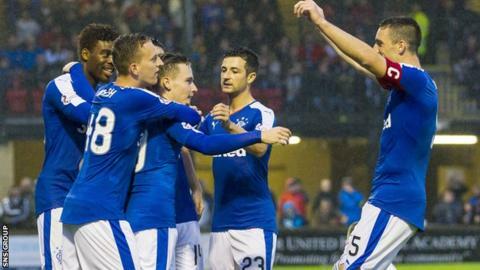 Rangers will meet trophy holders Livingston in the quarter-finals of the Petrofac Training Cup. The Championship rivals will meet on the international break weekend of Saturday 10 October, along with the other ties. St Mirren are at home to free-scoring Dunfermline and Peterhead host Stenhousemuir. A League Two side is guaranteed a place in the last four since Queen's Park have been drawn against Elgin City.